Overview: In this lesson, you learn how to create and modify a basic wall element. 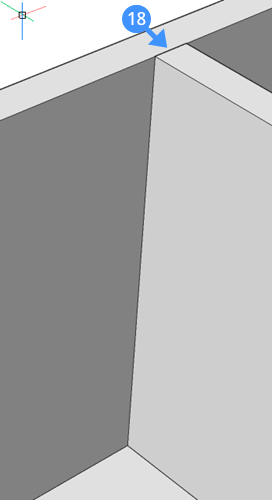 Use the Polysolid tool to create a basic wall. Create walls using an existing 2D plan. Create a connection between the two walls. Connect walls to other elements. The Polysolid tool lets you create wall solids by selecting a start point, an endpoint and providing a height. 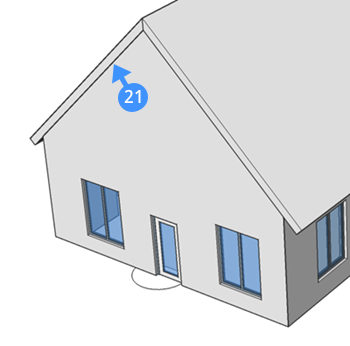 Note that in BricsCAD BIM, we start by creating the geometry first, and only later adding materials or compositions. That way we don’t have to worry about details when we’re modeling our preliminary design. 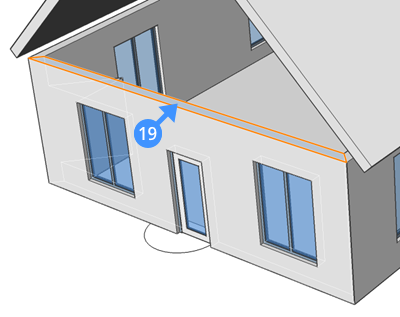 When drawing walls it is recommended to use Dynamic Dimensions to specify the length of the wall and Polar Tracking to control the direction. The following are general steps to create a wall element using the Polysolid tool. Select a start point, the footprint (1) of the wall displays automatically. Move the cursor in the desired direction, the current length value displays in the length dynamic entry field (2). Select an endpoint or enter a value in the “dynamic input field” and press enter. The footprint (3) of the adjacent wall displays automatically. You can keep creating adjoining wall segments by clicking the next points or entering values in the dynamic input field. Press enter once more or right-click. The height of the wall displays dynamically in the height field (4). Herein, you can change the default height of the wall. To change the width of the wall use the width field (5) by pressing TAB once. You can switch between the two dynamic input fields by pressing TAB. To change the justification of the wall hit the CTRL key while the ’Polysolid justification Hotkey Assistant widget‘ appears at the bottom of the screen. Note that the width and height of the wall that was used previously will be the new default values of the next Polysolid. Using an existing 2D plan view enables you to create a wall element in 3D. Click the “Polysolid” tool from the quad and type “E” on the command line or select “Entity” in the prompt menu. Using the “Entity” option in Polysolid enables you to create 3D geometry from a 2D layout. Choose a 2D linear entity which will be the Polysolid base. Lines, open and closed polylines, arcs, circles, ellipses, elliptical arcs, and splines are accepted as a polysolids base. Move the solid up or down and left-click to set the height of the wall, enter a value in the dynamic input field, or right-click to accept the default value. The current width of the wall appears in the Width Field. Press the Tab key to change the default value of the width. The Hotkey Assistant appears to remind the possible options to set the justification. Press CTRL key to cycle through the wall justification options. 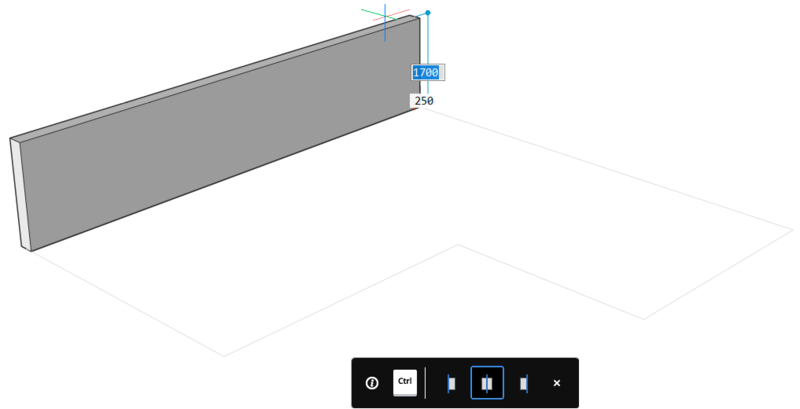 The BimConnect tools enable you to connect one wall to another element. 1. Select two wall elements and apply the LConnect tool. When two walls intersect, a miter connection between two walls will be automatically created by default. The following illustration shows the wall elements before (9) and after (10) applying the LConnect tool. The layout of the wall connections can be changed by using the ‘LConnect HotKeyAssistant widget’. This widget appears at the bottom of the screen with the available options after you apply the LConnect tool to the selected walls and HKA is turned on in the status-bar. 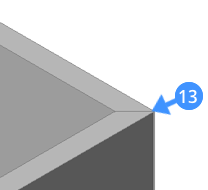 The wall connection can be made to bisector L-connection (11), L parallel type (12) or L parallel type 2 (13) accordingly by pressing the CTRL key. The selected connection type is indicated by a blue frame. When the bisector L-connection is selected, the walls are connected to an end face in the other wall in an angle 450. When the connection is made between the two walls selecting the L parallel type 1 or type 2, the walls are connected to an end face in the other wall in an angle 900. Press Enter key to accept the current connection type or press CTRL key to cycle through the possible connection options. The connect with nearest tool allows you to connect a minor face of a wall to the major faces of other elements, regardless what the orientation of the faces is. This tool can be used to connect the top or bottom face of a wall to a roof or a floor slab or to connect the side faces of a slab to walls. Note: Before using the connect with nearest tool, make sure the Select Faces option is enabled in the selection mode settings. Before using the connect with nearest tool, make the Select Faces option is enabled in the selection mode settings. In the drawing area, highlight a face or faces that need to be connected to another wall (14). Use Connect with nearest tool from the quad. 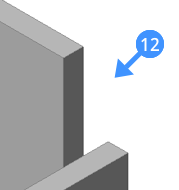 The connect with nearest tool automatically makes a T-connection (15) between the two walls by moving the face of the first wall to the nearest face of the other wall. The connect with nearest tool can also be used to connect the multiple faces of a wall to the nearest face of another element. To start with selecting multiple faces of the building element, use Select aligned faces tool. This tool enables you to highlight all faces automatically which are coplanar with the highlighted face. 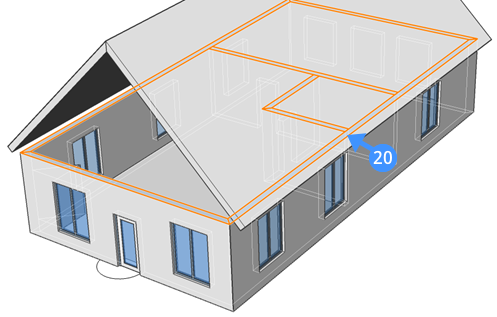 The following steps show how to connect multiple faces of the wall to the roof slab. In the drawing area, highlight the top face of one of the walls (16) and then click the Select aligned faces tool from the quad. 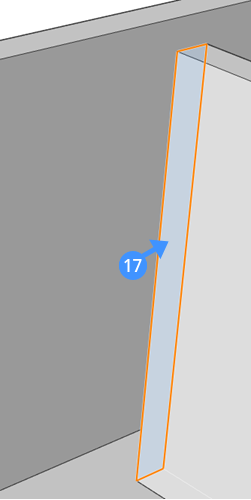 All aligned faces to this highlighted face will be selected (17). Launch the connect with nearest tool. The top faces of the wall are attached to the roof (18).